The traditional White Horse Inn Hotel on Lake Wolfgang is blessed – with a unique location right on one of the Salzkammergut's most beautiful places. Take a look through the webcam on Lake Wolfgang and the St. Wolfgang webcam. The webcams at the Romantik Hotel White Horse Inn are positioned on one of Lake Wolfgang's most interesting spots. They are placed right above the hotel's all-year heated lake lido as well as the sun terrace - with the all-year heated lake lido and unique floating Jacuzzi. You won't find another webcam in St. Wolfgang with views more beautiful than these! Even if it's still a couple of weeks before you can sit on the actual lake terrace at your White Horse Inn hotel to take in the views over Lake Wolfgang: enjoy taking an occasional look through the Lake Wolfgang webcam up until then. The webcam at White Horse Inn brings the most gorgeous impressions from your holiday in Austria to your living room. 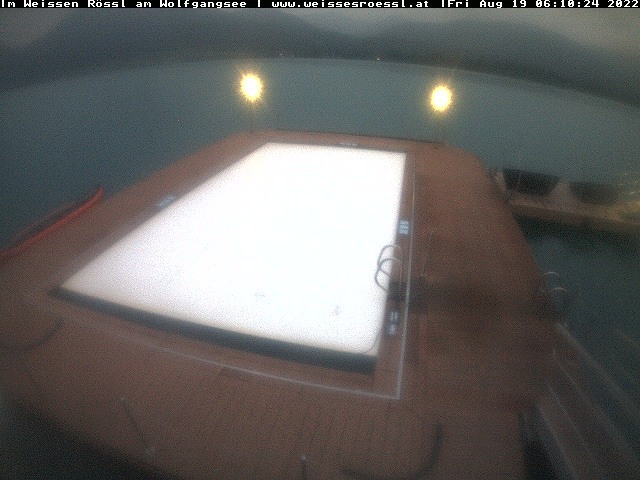 Experience a bit of the exclusive holiday atmosphere on Lake Wolfgang with the White Horse webcam. Because, pleasant anticipation is the best way to shorten your wait for the holiday! Do you want to soon enjoy these views live? Then book your room at the holiday hotel on Lake Wolfgang now or send us a no obligation holiday enquiry!